Someone will tell you that you need some gadget that wraps your plastic disposable diaper in plastic thus mummifying your lil one's poop for eternity. Don't do it. Now don't get me wrong. We did the disposable diaper...Pampers to be exact. But we didn't mummify our daughter's diapers either. 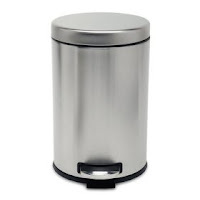 We used a regular garbage can just like the one pictured and a can of Lysol spray. And for the most part, it worked. There were times when the diaper needed an immediate trip to the alley, but not too often. And we do have some friends who decided to not do the disposable route with, I think, Fuzzi Bunz. They love it! Feel free to leave your suggestions for cloth diapers in the comments. All the diapers go immediately to the outside garbage in our house. But I agree that the garbage can with a lid is just as good of a choice as the expensive contraptions they try to get you to buy.